Now that the back of the wharf wall has been rebuilt to the level of the coping stones there is a substantial; trench running along behind it. Adrian asks Norman to move rubble with the Kubota tractor to back-fill this trench. This is quickly achieved so whilst Norman continues moving rubble around the site and leveling uneven surfaces, Adrian drives down to Appledore with his trailer, to buy a couple of tons of concrete ballast. 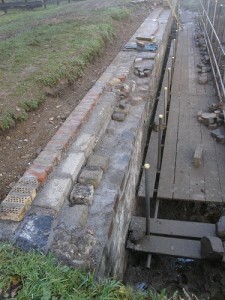 Once back on site he sets up the shuttering for the coping stone blocks and begins mixing concrete. Intermittent rain showers prove to be a nuisance and makes the surface of the site slippery but by the end of the day another block is cast and the site is looking a lot more tidy and level.